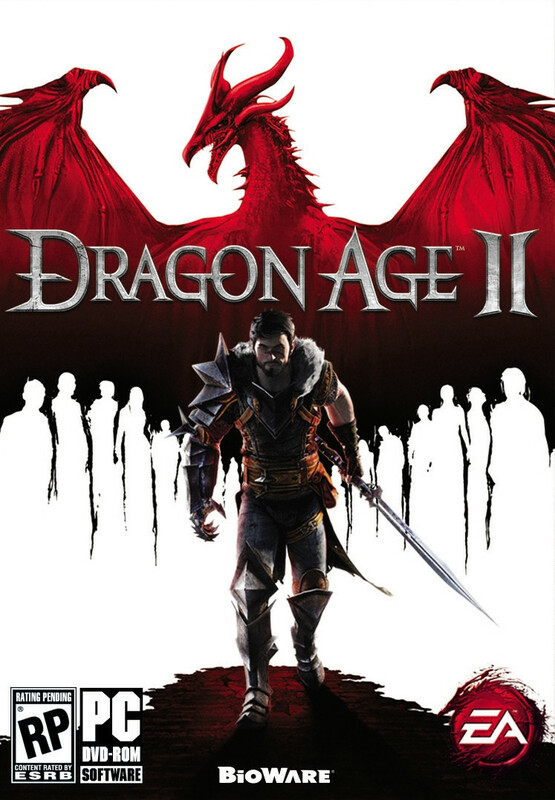 Dragon Age II is the sequel to Dragon Age: Origins, which was released by BioWare (developer) and Electronic Arts (publisher) less than 18 months ago. If you're like me, and you paid attention to the previews and trailers and hints dropped by BioWare -- including the now infamous "when you press a button, something awesome happens" comment -- then you knew that Dragon Age II wasn't going to be a whole lot like Origins, and the question only remained: how far would BioWare go? Well, they went pretty far, and as a result, while Dragon Age II isn't necessarily a bad game, it's nothing like what I was hoping for (or probably what anybody who fondly remembers the Infinity engine games was hoping for), and it continues BioWare's downward development trend from interesting role-playing games to simplified action games. Dragon Age II starts out in parallel with Origins. You play a character fleeing from the destruction of Lothering (which was sacked early on in Origins), but then you make your way to the city of Kirkwall where, a year later (and with all of the events from Origins and Awakening now in the rear view mirror), your adventure starts in earnest. You then do the usual -- you meet up with some companions, you complete some quests, and you learn about the world you're in -- before the game culminates with a major boss battle and you save the day. Unfortunately, the story is about as uninspired as the generic description I just gave for it. There isn't much of a plot (you basically just wander around and complete 150 side quests on your way to the end), your companions are sort of dull (with voice acting to match), and the quests are less than memorable (there are almost no interesting villains; you just defeat hundreds of anonymous bandits and mercenaries over and over again). The game sort of feels like BioWare went to an RPG rummage sale and bought whatever quests and story ideas were available, and then just threw everything together. Worse, the story culminates with you picking a side between the mages and the templars, two groups who have had a longstanding conflict, but this decision isn't any fun at all. Unlike, say, The Witcher, which used a similar concept, the two sides in Dragon Age II aren't shown in varying shades of gray; we only see the negatives. Just about every mage is secretly a blood mage or an abomination, and just about every templar loves to torture or oppress mages. I didn't like either side, and I didn't want to help either side, and that made the conclusion to the game even less exciting than it might have been otherwise. Finally, I didn't like some of the "twists" BioWare inserted into the story. As with Origins, some of your companions can leave you or die, but unlike Origins, it's more the plot deciding when these things happen rather than you. In the game I played with essentially a lawful good character, I ended up with only one mage who could heal -- and he turned out to be something of a murdering psychopath. My character should have executed him for his crimes, but I was worried about how the end of the game would go if I only had potions (and their extremely long cooldowns) to rely on, and so I reluctantly stayed with him. That just ended up being one more reason out of many why I wasn't happy by the end of the game.